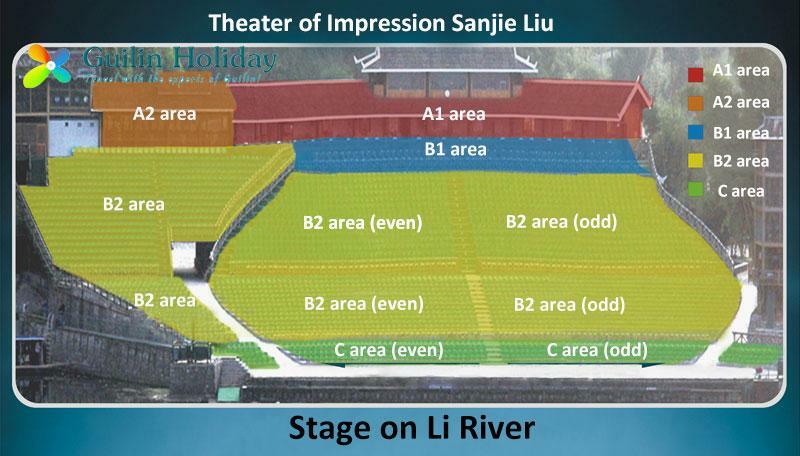 Overview : We offer reliable ticketing service for Impression Sanjie Liu light show on the Li River - the world largest natural theater. 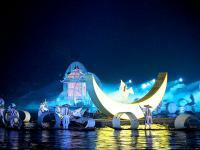 A well-known water staged show in Yangshuo, which was claimed to be the largest outdoor musical in the world, has its performance site on the Li River, together with 12 karst illuminated hills as the setting, and more than 600 performers (mainly local farmers), creating a grand, overwhelming show in front of the audience. The ticket prices don't include the transfers, we can arrange a van for hotel pick-up and drop-off service. And at the theater, we will arrange a local guide to show you the way (sometimes overcrowded at the entrance). I wanted to book five tickets (plus hotel transfers from a Yangshuo hotel- was thinking of River View Hotel?) to impressions SanjieLui for 3 adults and two children (6 and 9 years) in Presidential seating on October 24th. We will stay in Yangshuo for two nights (24 & 25 October). We would require two rooms. 1. I am coming in the month of May 2017. How crowded the place will be? 2. Do you also sell a DVD of this entire show? If so, what is the price? Yes; for most travelers, the show is a can't-missed evening activity in Yangshuo. There will be a bit crowded at the theater. We do not sell the DVD of the show. You can buy it inside the theather. Can you please let me know if there are 2 show or 1 show in march. Mainly on 20th March Monday. We are more than happy to be of service to you. In March, usually there is just one show per night (perhaps two shows at weekends), arranged by the theater based on the number of audiences. The show is set to start at 19:45 and lasts for about one hour and 10 minutes. We arrive on the 31st of December 2016. We would like to know if there's a show on the 31st or on the first of January or both days? We are very glad to be of service to you. Impression Liu Sanjie is a grand outdoor musical night show in Yangshuo. Good news for you that the show is available till January 2. According to latest news from Impression Sanjiu Liu management, the show will be closed for about one month, from January 3rd - 29th, 2017. Have you heard when they will close for winter this year? Also how many shows per night are they doing in the next couple of weeks? Thank you. For Impression Sanjiu Liu, it is always closed for about a month before Chinese Spring Festival–which falls on January 28 of 2017 year, and re-starts on the 3rd day of this festival. Hi, please help to book 2 tickets at the B1 area on 15 Oct 2016 06:40pm. We are very glad to be of service to you. 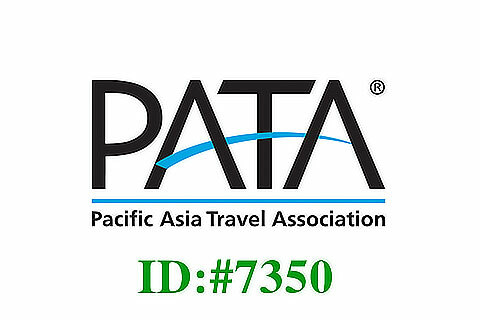 For tour details, our travel specialist will be in touch with you soon via email. We are visiting Yangshuo for a few days during the first fortnight of January 2017. Our dates are still a bit flexible. We are very interested in the Impression Liu Sanjie Show but we are not sure if the show will be on or not as some sites say that it's playing all year round (except extrem bad weather) and other sites say that it stops every year around a month, usually in January. Can you please clarify so I can organize our trip accordingly? Since the Impression Liu Sanjie is an outdoor show, it could be very cold to watch it in winter. We haven't got the final news of when the show will be closed during the winter time. Based on our experience, they tend to stop the show about one month before the Chinese Lunar New Year's day. In 2017, there will be an early lunar new year's day on Jan 28, therefore, the show could be suspended in late Dec or early Jan.
For further info, our travel specialist will be in touch with you soon via email. Hi, please help to book 2 tickets at the B2 area on 7 Aug 2016 night. We are so glad to be of service to you. For tickets booking of Impression Sanjie Liu show, our travel specialist will be in touch with you soon via email. We are very glad to be of service to you. Regarding the ticket booking of Impression Sanjie Liu show, our travel specialist will be in touch with you soon via email. I'm in Guilin/Yangshuo from 6 till 10 January. Is there a change that there will be a show during this week? Impression Sanjie Liu is available all year around except for cold weather and heavy rain. And always, the show is usually closed for about a month before Chinese Spring Festival (February 8, 2016), and re-starts on the 3rd day (February 10, 2016) of this festival. Based on our own experience, possibly the show will be closed during your stay in Guilin. If there are any changes, we will contact you via Email. Would like to buy 9 tickets for the 8pm show. 1) Any price different for Adult & Kid? If YES, how much for Adult & Kid tickets? We are so glad to be of service to you. For your requested Li River Cruise, one-day trip to Longji terrace and Impression Sanjie Liu , our travel specialist will be in touch with you soon via email. For most tourists, Impression Sanjie Liu show is a can't-missed evening activity. The show is available all year around except for cold weather and heavy rain. Based on our own experience, the show is usually closed for about a month before Chinese Spring Festival (February 8, 2016), and re-starts on the 3rd day (February 10, 2016) of this festival. Thus, the show can be available for the coming new year 2016 on January 1. 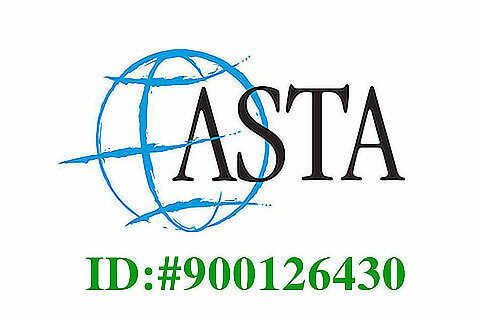 If you have any questions and special requirement, please feel free to contact us at anytime. How do I buy 6 tickets for the Liu Sanjie show on April 9, 2015? For travelers, Impression Sanjie Liu is a can't-missed evening activity. We are very pleased to be of service to you. For more details, an Email will reach you as soon as possible. I am currently in Guilin and wanted to see this show but I heard that it was not running at this time. Is that correct? Yes, Impression Sanjie Liu is closed from January 12 to February 20, 2015, and will be reopen on February 21, 2015. Impression Sanjie Liu is available all year around except for cold weather and heavy rain. And always, the show is closed for about a month before Chinese Spring Festival, and re-starts on the 3rd day of this festival. We are in the area in the period from 17 to 20 February. I was told that the show did not take place at that time. Is that correct? Otherwise if the show does occur, it is already possible to buy tickets? Impression Liu Sanjie Show is an outdoor grand performance in Yangshuo, with a stunning natural backdrop of the Li River and karst mountains, in Yangshuo Guilin. 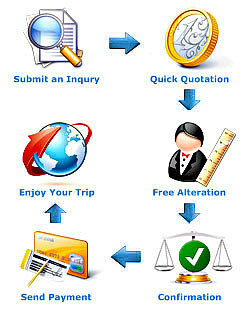 For details, our professional travel consulant will contact you as soon as possible.